A company’s logo makes up a large part of brand recognition. There are some logos that are unmistakable and unavoidable. Think of the McDonald’s golden arches, Google’s multi-colored letters and the sprawling cursive on Coca-Cola products. When designing a logo, a website and official company communications, it’s best for branding to stick with the same hue. This should also be the basis for promotional products, among other marketing efforts. Entrepreneur reported on a study conducted at the University of Amsterdam that focused on how old people are when they can recognize logos. It found that people can identify a brand by age 5 and can recall a logo’s color and shape by age 8. Results also showed that 100 percent of 9 year olds could draw the connection between a logo and the products it represents. Additionally, Fast Company discovered that 85 percent of consumers said colors affect their willingness to buy a specific product while 80 percent felt brand recognition is enhanced by the color scheme. When it comes to choosing colors to represent the brand, sometimes simple is better. Column Five found that 95 percent of businesses use just one or two colors for branding and appearance, so that may be a statistic to note when perusing custom promotional products. Shades of red are associated with intensity. They can evoke an emotional response ranging from passion to aggression. Red may make people want to be more active or trusting. According to Business2Consumer, industries that often use red for logos and branding are agriculture, cars, food and technology. Happiness, enthusiasm and creativity are inspired by the color orange. It may mentally stimulate people and make them feel determined. Orange is a popular color for businesses in the technology and healthcare sectors. Shades of yellow are often used by energy companies, businesses in the food industry and producers of household products. The color is associated with energy, joy and freshness, according to Entrepreneur. Because of the common use of the phrase “going green,” the hue is popular for environmentally-conscious brands and energy companies. It relates to nature and can bring feelings of peace, hope, trust and calmness. Other industries that tend to use green in their logos are food, household goods, technology and finance. Different shades of green may have separate implications. Entrepreneur asserted that dark green is perceived to be more prestigious, while lighter shades speak more to the calming properties. Most of the 100 most valuable brands use blue as their main branding color, according to Column Five Media. Certain types of companies are more likely to choose blue to represent the brand, including energy, finance, technology, agriculture, healthcare and airline. Entrepreneur noted it can make consumers think of depth and stability. Blue can also invoke feelings of confidence, calmness, comfort, clarity, understanding and faith. Deep purple has long been associated with royalty and prominence. 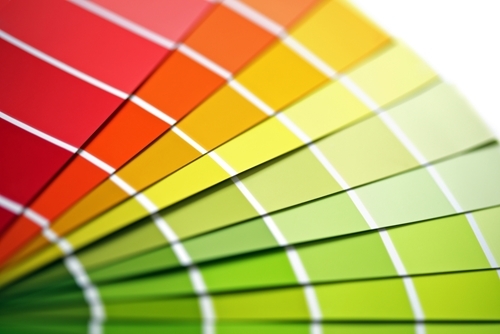 Though it is considered to promote creativity, sectors that often use the color are healthcare, finance and technology. Like most colors, various shades can inspire different feelings. For example, lavender appears more sentimental than dark or bright purple. Because of long-established gender norms, pink is mainly thought of as a feminine color. It can imply sentiments such as love, warmth, sweetness, nurture and sexuality. However, it’s refreshing to see a company that deals with products or services that aren’t necessarily directed at women use shades of pink. Often used for clothes companies, car manufacturers and technology firms, Entrepreneur pointed out that black is both formal and mysterious. The inclusion of every color into one dark hue is thought of as bold, serious and luxurious. It may not be shocking that white is a popular color in the healthcare industry. The color implies cleanliness, purity, freshness and nobility with its crisp appearance. Agriculture and clothing companies tend to choose brown to represent the brand. It’s associated with nurture, support, reliability and dependability.